Mechanical Engineering junior Carlos Casarez has been awarded a Goldwater Scholarship, the premier national award granted to undergraduate students majoring in mathematics, natural sciences and engineering who are interested in research careers. Casarez is advised by Assistant Professor Sarah Bergbreiter (ME/ISR). He spent a summer at the Biomimetic Millisystems Lab at University of California, Berkeley. He is a Banneker-Key Scholar and a member of the Louis Stokes Alliance for Minority Participation Undergraduate Research Program and the University Honors College. 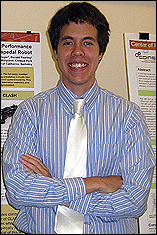 He plans to pursue a Ph.D. in mechanical engineering, working on robotic technology. Created by Congress in 1986 to honor Senator Barry M. Goldwater, Goldwater Scholarships are designed to ensure the nation has a source of highly qualified scholars and researchers. Recipients are chosen based on academic merit, research experience and career objectives. Prof. Robert Infantino, associate dean in the College of Chemical and Life Sciences, is UM's Goldwater program faculty representative, and chaired the university's nomination and advising process.